When I was working out in Hong Kong last October, I noticed the developer was using a desktop through his browser. I thought it was a remote desktop to his PC back at home, but it turned out that it was an online virtual desktop from Startforce.com. I signed up, and I’ve got to say I was very impressed! The desktop was very stable (on IE6, Firefox has its own issues, another blog on that later! ), and apart from some sporadic interruptions, usually fast and responsive. 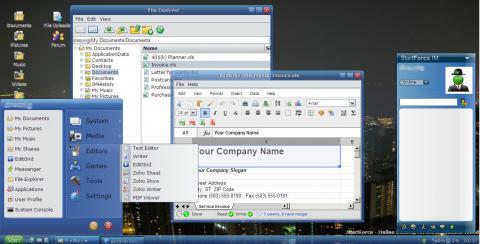 It’s also very easy and familiar to use, with a look and feel of Windows XP. I’m a big believer in the future of web applications, one day nearly all applications are going to be built this way (apart from those requiring offline access) and Startforce hopes to become the online platform for these web apps, just like Facebook is trying to be the platform for social web apps. However there are two things Startforce will need to address before it becomes a standard that people will develop for and actually use, pretty much the same things all new platforms (I hate to use OS as its not but very similar!) have had to: a large user base to develop for, and a range of useful “killer” applications for users to use. The chicken and the egg problem! Startforce is wise to give free access to users to use the system, I’ve already signed up for my free account to play around with, but to be honest, after playing around for a bit, I ran out of things to do! There’s barely any useful apps, the Zoho office apps it comes with are basic, definitely not a replacement for Microsoft Office! But even with free access, I’m not sure how many users have actually signed up, other than randomly seeing someone using it in Hong Kong, I’ve haven’t met anyone else who’s heard of it. But like any “new” idea (this ideas been around for ages, this is just the best implementation I’ve seen of it before!) you’d be stupid not to imagine the future. And what I like about this start-up is the potential it has for Enterprise! I don’t think that Startforce is aiming for that market, in fact I really can’t find any information on their business model and how they aim to make money, I would hate them to spoil the interface with loads of Google ads! But isn’t thin client computing the dream of any enterprise? I think their platform is built on J2EE, an enterprise standard, if they could develop the office applications further to properly compete with Microsoft Office, I could imagine this being a platform for the future in Enterprises. Firstly, if its used on a corporate network, the Internet bandwidth issues would be controlled, while still allowing out of office access to workers over the Internet, a distributed architecture would allow the system to be deployed around global offices, but most importantly it would allow enterprises to do one click installs! As an IT consultant we always have to explain to business users that upgrading to the latest version of a thick-client application (at the moment the hot one being Microsoft Office 2007) is far more involved than just sending out a technician with an install CD; hardware upgrades, the cost of actually sending all those technicians around the organisation, support issues for users not used to the new software, training… the list goes on. The beauty of thin client computing, is all IT has to support is a thin client computer (basically a dumb terminal so simple is rarely breaks down!) and in a couple of clicks can roll out new applications and upgrades to the whole organisation, no more unpatched applications still sending that virus around! It is a paradigm shift for how IT departments would operate in large organisations, potentially saving millions in support and the number of staff needed to maintain a large corporate network. To be honest, I’ve barely found any info through Google on the start-up, their business model, or future plans. Jin Koh is the founder and CEO, and has made a pitch here on Vator.tv (see below) but I would love to find more info on them. If you know any good links, or actually work for this start-up leave a comment or contact me, so many questions, they should really have an “About” page on their website!